Presidential candidate Donald Trump‘s aggressive tone and occasional outlandish statements have dominated the conversation in the Republican primaries, and today is sure to be no different. Though his supporters feel that he’s a shoo-in, his real estate track record hasn’t always resulted in success. Take for example his fraught attempt to own the Empire State Building, which ended in lawsuits and public shaming, or his $80 million loss on the Plaza Hotel, which resulted from his near bankruptcy in the ’90s. 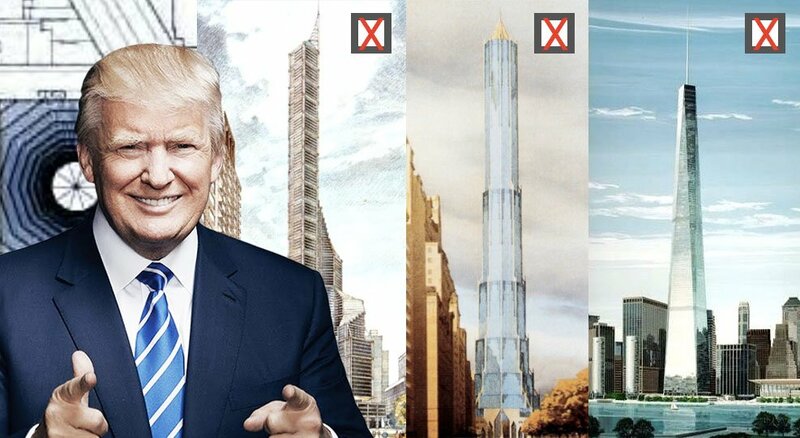 In addition to these public debacles, the developer-turned-showman-turned-politician has envisioned at least three of the world’s tallest buildings in New York over the years, which makes sense for a man who glories in superlatives and for whom every project is a flamboyant gesture. 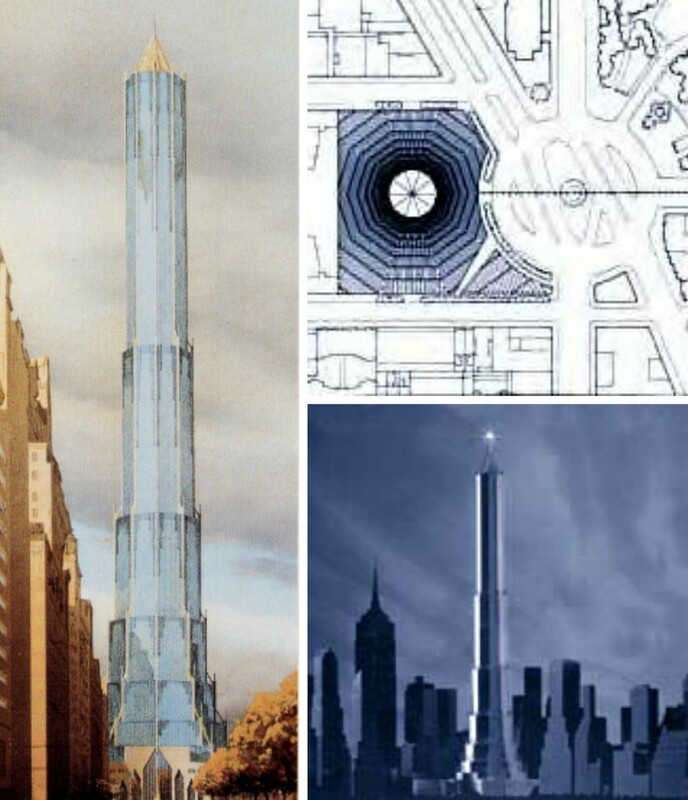 In honor of the Donald’s never-ending presence, 6sqft decided to take a look at these never-realized, sky-high proposals, which include the New York Stock Exchange Tower, Television City Tower, and 10 Columbus Circle. In 1996, Trump proposed building the world’s tallest building for the New York Stock Exchange on pilings at the foot of Wall Street. Envisioned to rise 140 floors and 1,792 feet high, the Kohn Pedersen Fox-designed tower would eclipse the then tallest Sears Tower (now Willis Tower) by more than 30 stories and wold take nearly four years to build. To be known as New York Stock Exchange Tower, the tampering and chamfered glass tower (not unlike One World Trade) was to encapsulate 3.5 million square feet of office space and estimated to house 100,000 office workers. While City Hall and then NYSE Chief Executive Richard Grasso greeted the plan with “huge enthusiasm,” the offshore site was not owned by Trump and would have had to clear countless governmental hurdles. The East River site had also been the location of numerous failed proposals before including Manhattan Landing, a downtown Guggenheim location, and more recently, Seaport City. The exchange later mulled moving a 51-story tower designed by Skidmore Owings & Merrill directly across from their current location at the corner of Broad and Wall Streets. Ultimately, the attacks of 9/11 and the resulting economic downturn shelved relocation plans. At the development’s center, on axis to West 66th Street, would be the world’s tallest building, standing 150 stories and 1,670 foot high. The tower proposal, which was tri-axial in plan a la engineering marvel Burj Khalifa, would accommodate offices on its lower floors and more than 100 floors of apartments above. 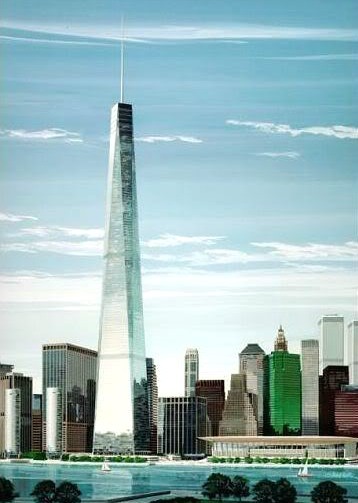 Six 72-story towers and a 65-story office tower would accompany the supertall, and altogether the scheme would yield 8,000 apartments, 3.6 million square feet of television and motion picture studios, 1.7 million square feet of retail, 8,500 parking spaces, and 40 acres of open space. 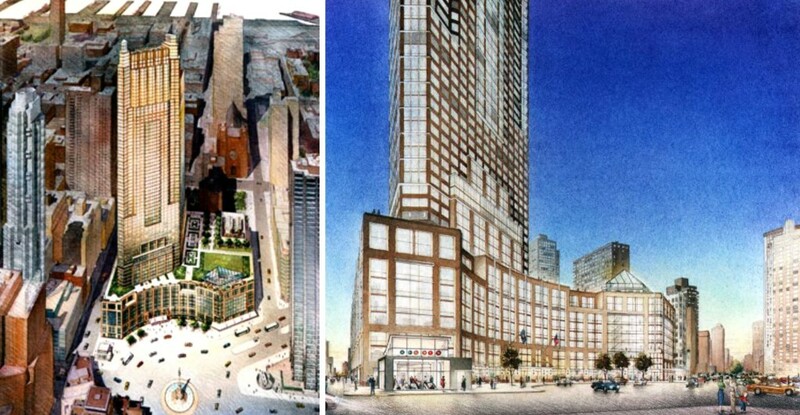 The entire development would be raised on a platform on level with the adjacent elevated West Side Highway. Unsurprisingly, the monumental plan drew plenty of criticism. Esteemed architect Michael Sorkin remarked, “Looking at the boneheaded proposal, one wonders whether the architect even visited the site,” and regarding Trump he asks, “Was ever a man more preoccupied with getting it up in public?” Paul Goldberger, then architecture critic at the Times, questioned the sensibility of building a residences that high, saying, “Living 120 or 130 or 140 stories up in the air is fine stuff for fairy tales, but it has little appeal in real life.” After a series of alternative proposals, planners settled with the mediocre and forgettable design realized today. Now known as Trump Place, the site holds a prosaic ensemble of 16 mid-rise towers meant to be within context to the Upper West Side. When the Javits Center was completed in 1986, it sealed the fate of the Coliseum, a convention center that stood at Columbus Circle from 1956 to 2000. In the years leading up to its eventual demolition, developers and architects had grand visions for what could become of the prime site. 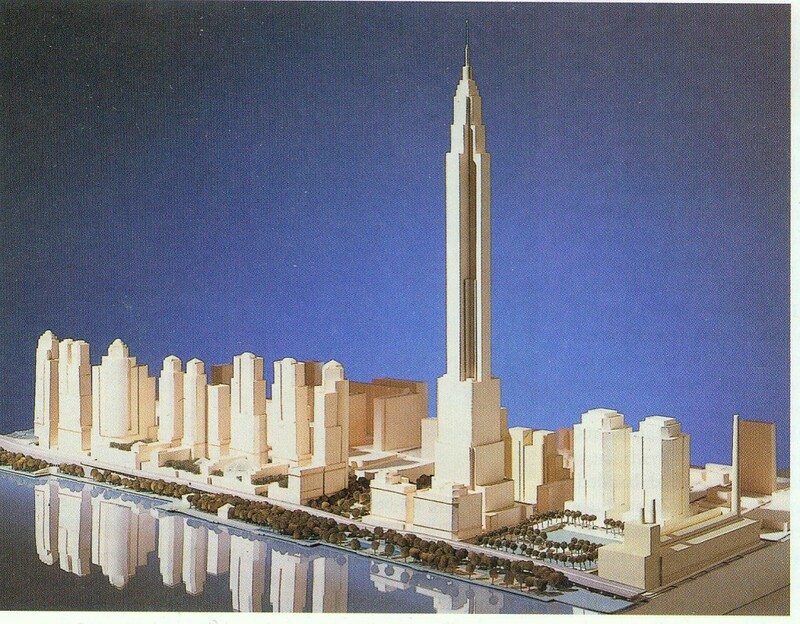 In 1984, the city, state, and Municipal Assistance Corporation agreed to offer the 150,000-square-foot parcel for lease, claiming it could hold “the tallest building in the world.” The following year, the MTA (who was responsible for the site) placed it on the market, asking prospective bidders to submit design proposals. The only requirements were that the plans have retail space along Columbus Circle with a base that conformed to the curves of the Circle. Ultimately, another proposal was chosen, and for the next decade, the city, developers, and politicians went round and round with who would purchase the site and what would be built there. By 1995, the MTA announced that it would start from scratch and issued a new request for proposals. This time, the height was capped at 59 stories, and nine teams submitted bids. Trump once again threw his hat in the ring, partnering with Colony Capital and enlisting Robert A.M. Stern and Costas Kondylis. 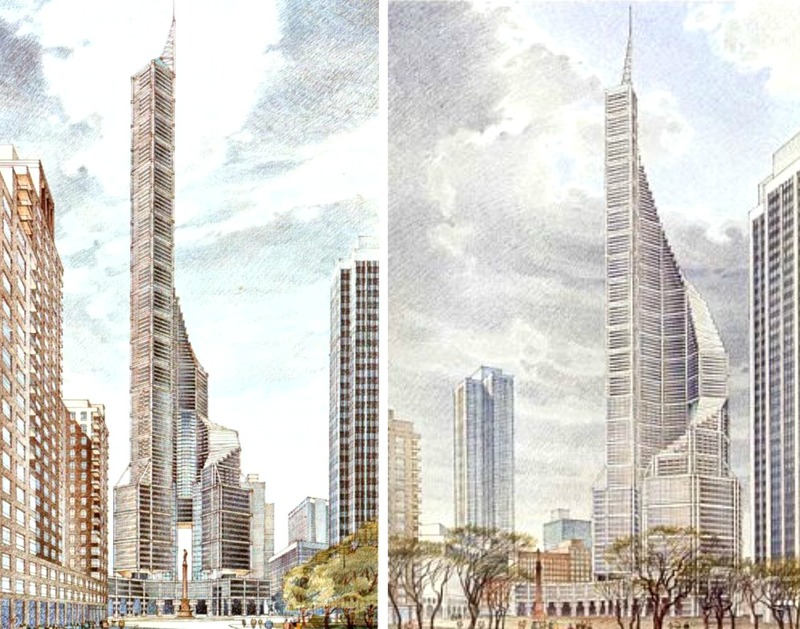 They proposed a 750-foot tower angled towards the park with bay windows and a modulated top that resembled the early skyscrapers of Manhattan. It was rumored that Trump offered up to $300 million for the site, namely to protect the views of his nearby Trump International Hotel & Tower. But in yet another snag, in 1998 the city and state decided to ask for re-submissions. Trump’s interest had already begun to fade, and when Time Warner joined forces with the Related Companies, his single-slab design became less popular, as did his outspoken ego. Later that year, Related paid $345 million for the site, eventually giving birth to the Time Warner Center. Please credit the artists who’s work you post. It is a requirement of the ‘fair use’ clause in US copyright, and good form for an architectural news site. At least his architects have taste and an understanding of the spirit of the city. Any of them beat the 432 Park Avenue atrocity. These work nicely into the skyline although too tall. Setting politics aside (which I see it may be hard to do after reading your slights), how about setting time aside regarding the positive outcomes Mr. Trump has done for the City? I’m sure you can find something nice to say…maybe. Thank you. My thoughts exactly. Wow. When the media is on your side (such as obama) you shine like a star when you are not. When they are against you….look out! What was the name of the NYC project in the early ’70s that trump built on a toxic landfill site? No. This was a middle-class and under project sometime between 1968-1972. It was built on a toxic site and thousands of people got sick. Can’t remember the name of it. It had the nickname of “Sickness City”.